Out of all the questions we get, “What should I wear on tour?” is one of the most common. And for good reason! If you’re heading to Hana or Haleakala for the first time, you may not know what to expect, and you want to be prepared! No worries; we got you! Below, you’ll find a guide on what to wear and bring along for every tour. For all four of our Hana tours, our recommendations are pretty much the same: dress in comfortable clothing, and wear good shoes for walking in the rainforest. Your clothing should allow for freedom of movement, because even though we’re not a hiking company, you can expect to traverse some uneven terrain, or even more if you’re adventurous! The weather in East Maui is similar to the rest of Maui, but can be a few degrees cooler, so you might want to bring a light sweatshirt or jacket, just in case. You can definitely expect rain, so a rain jacket would be ideal, but we provide premium umbrellas on every tour. Lava rocks, vines, dirt, and roots are all part of the landscape while you’re exploring the road to Hana, so you’ll want shoes that are up to the challenge. We recommend tennis shoes or sneakers, but athletic-type sandals are also a good option, as long as they have a covered toe, and a good amount of tread. If you plan on swimming while on tour, bring a swimsuit and towel along in a beach bag—there are places to change at the swimming stops. For the Hana Ultimate, you will be dining at the upscale Ka’uiki Dining Room at the Travaasa Hana. While the dining room doesn’t have a strict dress code, you’ll probably feel comfortable in casual clothes, rather than just a beach cover-up. T-shirt, shorts, and sneakers are perfect. For the Hana Sky-Trek, you’ll be taking lots of pictures out of the windows of the helicopter, so wearing a bright white shirt isn’t your best bet. Black or navy blue makes for much less glare in your photos! We probably don’t have to tell you, but the name of the game for a Haleakala Sunrise is staying warm. The temperature at the 10,023-foot Summit changes seasonally, but before sunrise, it’s always pretty chilly. Temperatures can range from the high fifties in the summer months to below-freezing in the winter, but even “warmer” days come with a pretty hefty wind-chill. Our recommendations are long pants (jeans are great, but sweatpants are fine too! ), closed-toe shoes, thick socks, and a heavy jacket or light coat. Most people bring a warm hat or earmuffs too, and gloves or socks to warm up chilly fingers. If you have a thick, fuzzy beach towel or a blanket, you might want to bring that along as well– especially if you plan on cuddling up with your partner while watching the amazing show of light and color at dawn. For these upcountry day tours, you won’t need to bundle up like you would for a sunrise tour, but do plan for slightly cooler weather. For the Summit Lavender Sojourn and the Crater & Rainforest tour, you will be visiting the Summit of Haleakala. While temperatures aren’t as cold as they are before sunrise, it can still get pretty chilly, so we do recommend long pants, closed-toe shoes, and a light jacket. For your visits to the lavender farm and the winery on the Summit Lavender Sojourn, you’ll warm up by walking and exploring in the morning sun, but you may expect some rain or cloud cover on occasion. Your Tour Guide will provide you with an umbrella, if you need one. We definitely recommend closed-toe shoes for the Summit Lavender Sojourn, as it can get dusty at the lavender farm. Bring your ID if you plan on tasting wine during your visit to the winery. For the Crater & Rainforest tour, you’ll be traveling the Road to Hana as far as Ke’anae Peninsula during the second half of your tour, so expect a shift into warmer, more balmy weather. It’s a good idea to bring a pair of shorts to change into after visiting Haleakala in the morning. Finally, for the Haleakala Sun-Trek, the same advice for the Hana Sky-Trek applies: wear a dark-colored shirt for photos in the helicopter. 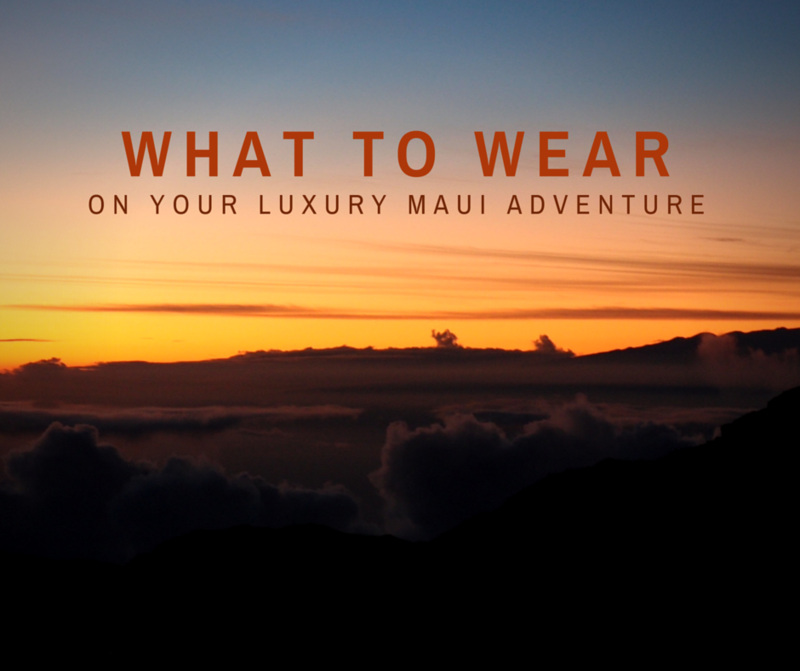 For the rest of the day, you’ll be exploring upcountry Maui, so comfortable clothing as well as a light sweater or jacket will serve you perfectly fine. You’ll be doing quite a bit of walking at Ocean Vodka, Surfing Goat Dairy, and in Makawao Town, so comfortable shoes are key for this tour. To participate in the tasting at Ocean Vodka, you’ll need your photo ID to prove that you’re over 21. On all of our land tours, a small bag that can sit at your feet in the Luxury Limo-Van is perfectly appropriate to carry a sweater, a change of clothes, or anything else you may need during the day. For your Hana Sky-Trek tour, the helicopter company does ask that you limit your carry-on bag to three pounds per person. As always, please let us know if you have any questions about what to wear, bring, or expect for your tour. 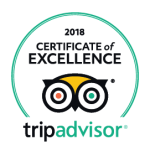 We take pride in ensuring a top-notch experience for every guest, and we hope you’re having fun planning for your next Maui adventure tour with us! One of the best things about our tours is the small-group aspect—only eight guests per Limo-Van! We absolutely love the dynamic that this brings to our adventures. Guests get a chance to mingle and interact with one another, and get real one-on-one time with their Tour Guide. Our Tour Guides get the chance to know each guest individually, and by the end of the day, they feel like they’re saying aloha to old friends! If you’ve got eight people in your group, then you’ll enjoy a tour all to yourselves! What if your group is bigger than eight, though? Are you on Maui for a family reunion? A sorority getaway? A business convention? If your large group is looking to enjoy luxury and personalized service on any of our tours, please call us! We love arranging group outings, and can send out two, three, four, or more luxury Limo-Vans to accommodate your larger party! You decide how you’d like to split up—and even if you’d like to rotate throughout the day! Any tour meals for the day will be enjoyed as a group, and you’ll have lots of time to enjoy the sites and experiences together. You’ll also be able to enjoy guided narration from more than one Hawaii Certified Tour Guide, which is truly an invaluable experience. 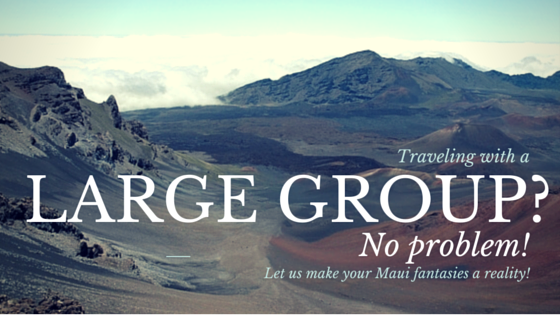 Perfect tours for larger groups are the Crater & Rainforest, the Hana Cave-Quest, and the Summit Lavender Sojourn. For group tours—and any other private tours—feel free to customize your itinerary to suit your group’s needs and interests. Trust us, we’ve seen and done it all, and are ready with plenty of suggestions of add-ons, tweaks, and adjustments to make your group’s tour absolutely perfect. Need to get back at a certain time to make it to meetings? You got it! Need a later departure time? Just let us know! All we ask is that you book your larger group tour in advance, to give us time to put everything together for your ideal day in paradise. If your large group is looking for the small-group experience, we’ve got you covered! 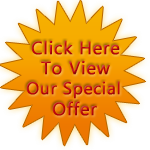 Call us at 1-800-817-1234 today! I’m sure that most people come to Maui for the year-round warm weather, for that “eternal summer” that lends itself beautifully to swimming, snorkeling, hiking, and sunbathing. Year-round summer is certainly a huge draw, but once October rolls around, sometimes you just want that “fall” feeling. I’ve lived here most of my life, and I must say, it’s been a little hard to come by—until yesterday. 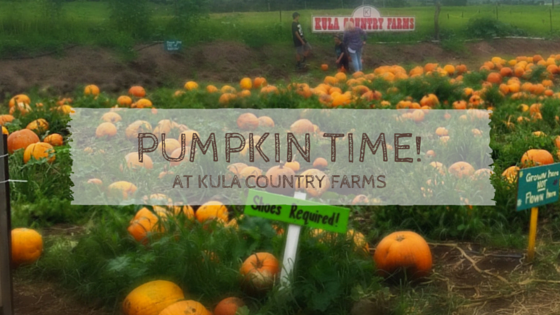 I’d heard about Kula Country Farms and their yearly pumpkin patch, but I’d never made it there. Now, I’m not quite sure why this hasn’t been annual tradition for my family—but it will be from here on out! 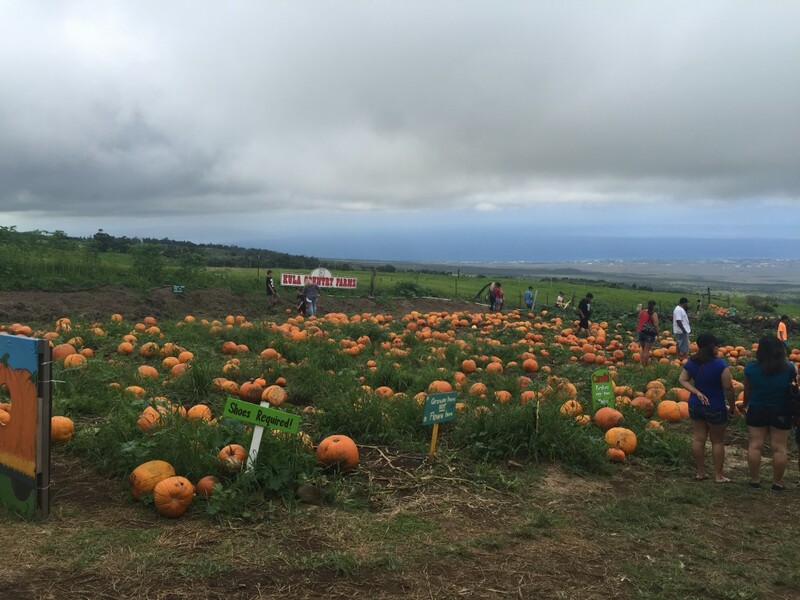 Hundreds and hundreds of Maui-grown pumpkins! If you haven’t been, I’d definitely recommend a trip to this serene upcountry farm, especially in October! The main attraction this time of year is the pumpkin patch—a huge field covered in pumpkins of every shape and size imaginable. Their simple price-by-size chart makes it easy to pick your perfect pumpkin, and they’ll loan you a cart in which to tote it around! Kids will love running through the fields, imagining the jack-o’-lantern possibilities. This place is not just pumpkins, though! After your careful gourd-picking, head back up the hill and visit their produce stand, for locally-grown produce that will wow you! Gorgeous, fat zucchinis, fresh asparagus, and tasty green beans were all available when we went, along with plenty of other fresh goodies—and homemade strawberry lemonade! Looking for something to take home? Look no further than their Kula strawberry jam and pancake syrups! 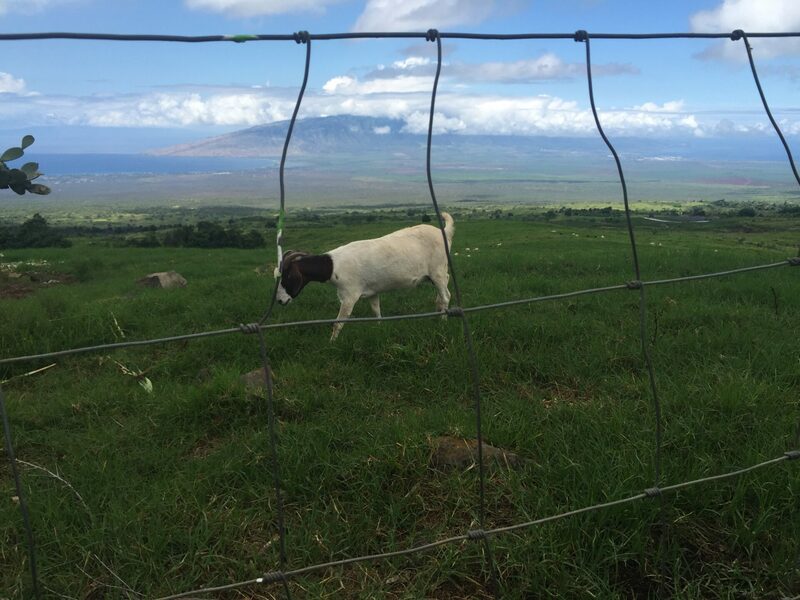 I am willing to bet that these are some of the happiest goats on the planet– check out that view! If you brought your kiddos, get ready to settle in, because this place is a keiki paradise! Games, homemade tire swings, and even a mini-golf course are on the property, making for plenty of family fun! My two-year-old loved the tire swings, and visiting the furry friends on the farm—a lazy rabbit, some fuzzy miniature horses, and countless goats! I took the time to sit back and watch these cuties while taking in the most beautiful island views I’ve seen in a while—true Maui bliss! Even if you’re not ready for fall or the approaching holiday season, Kula Country Farms is definitely worth a visit. It’s family-friendly, educational, locally-run, and is a beautiful change from busy resort areas. See you there!